Your company becoming bondable is similar to the process of obtaining bank credit. 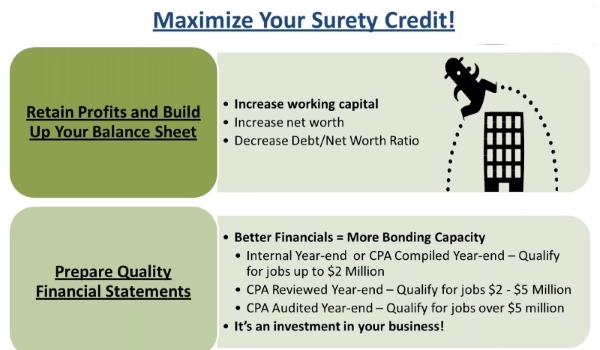 Setting up initial bonding with a surety agent may take a few weeks. Pre-qualifying means knowing what your company's bonding capacity will be before bidding or negotiating. Do you know your company's bonding capacity? You'll want to know your single contract limit and your total aggregate capacity - bonded and unbonded. Some of the ways that we help our clients to show that they need additional bonding capacity. First, try and keep capital in the business. Many business owners try and remove all of the equity from the business as soon as possible. Instead of doing that, be sure to leave the cash in the business. Second, don’t over invest in capital equipment. Most sureties discount the capital equipment as available to repay the surety. Instead of over investing in equipment, it is many times better to rent equipment and show additional capital on the balance sheet. Third, the financial presentation is key. We work with our business owners to get a good presentation, such as working with a CPA that knows how to present for sureties. There are a lot of sureties that say they know construction and how to present financials, but we find that there are only a few that really know how to get that done. Fourth, get a line of credit if you can. A line of credit will help out strongly with the cash flow of the business. Cash flow is king in this business and it’s good to make sure that you don’t run out of it. A line of credit will really help in this area. Swiftbonds is a company that focuses on surety bonds. We do bid bonds, performance bonds, payment bonds and other contract bonds. We also have commercial bonds, but not insurance. We are your performance bond specialists!